Nothing beats a relaxing day at the beach; it's the perfect way to spend your time on holiday and the breathtaking beaches of Bude make the perfect destination. Ideal for those who like to soak up the sun, splash in the sea, read a good book and for the more adventurous, Bude has some of the best surf breaks in the UK. However, you like to spend your day, here's a guide to the local beaches of Bude and the facilities you can expect at each breathtaking location. The beaches do not always have lifeguards so please check the RNLI notice boards at the entrance to the beach which will give times lifeguards are on duty. It is always advisable to swim and surf, when lifeguards are working, as the currents can be unpredictable, even on calm days. Some beaches are dog-friendly too, please see below for more info. Northcott Mouth is 3 miles North of Bude. At low tide, it is a beautiful sandy beach which can extend for 3 miles to Crooklets Beach in Bude (beware of incoming tides). Interesting geology and many secluded spots can be found. It is ideal for rock pooling. Home to Margaret's Tea Rooms which is a must for her famous Cornish cream tea! Northcott is also within walking distance of Wooda, and makes a great circular walk. Dog-Friendly / Cafe / Car Park / Lifeguard Cover July - Sept.
Carved into the rocks on Summerleaze Beach is Bude Sea-Pool a partially man-made tidal swimming pool that fills seawater on the incoming tide. A safe haven for small children to swim without the worries of tidal currents, this is a family favourite with locals and holidaymakers alike. It's a large pool so never feels crowded and can be enjoyed throughout all seasons (if you're brave enough). During the popular summer months, it is the perfect location to take a dip and cool off. Entry is free and everyone is welcome. Please be sure to follow the rules when you’re at the beach to make sure you stay safe. Always make sure you swim between the red and yellow flags, and always on a lifeguarded beach. Never take inflatables into the sea, and always check the tide times. Enjoy the sea, but be aware it can be a dangerous place! We are working with the Cleaner Seas Project, a national pilot being delivered in Bude by Volunteer Cornwall on behalf of the Environment Agency. The project hopes to address factors which are contributing to the quality of the bathing water of Bude’s beaches. Find out how you can help #SaveOurSeas here. 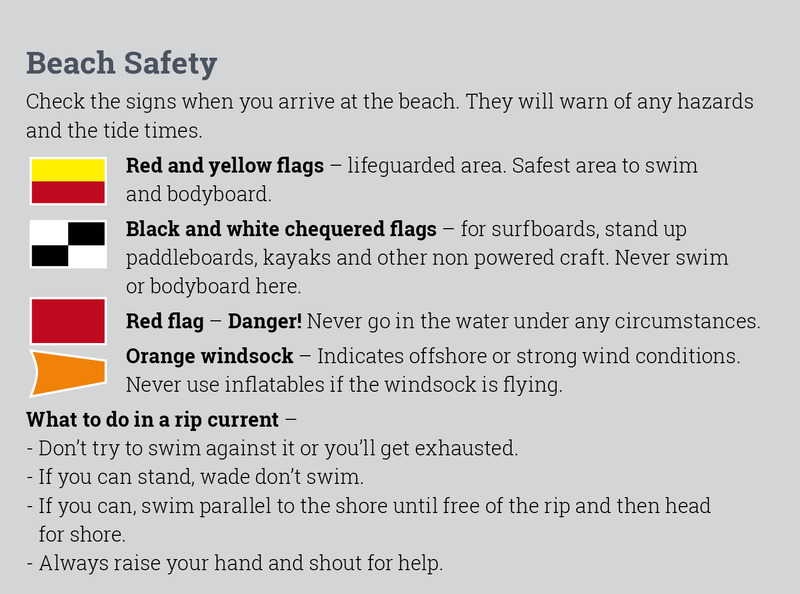 For more information on how to stay safe at the beach, visit the RNLI website here.